Performance Solutions, my personal product design and consulting business, was founded in 1982. It started off as a developer, manufacturer, and licenser of concrete maturity meters (1982-1986), then work was done around developing a business plan and product concept for a cablevision based digital audio distribution system (AudioDial - 1988), then work was done on pursuing the development of after-market performance vehicle computers (Digitune - 1985-1989), and then Performance Solutions operated as an engineering consultancy (1992-1993), and it again currently operates as a consultancy practice today (2006 onwards - see Performance Solutions - Overview). As someone who has always had an entrepreneurial bug, Performance Solutions has been my outlet and vehicle on many occasions to innovate and explore different business pursuits - in between and as an adjunct to various employment positions I have also held over the same 25 year period. Performance Solutions has played an integral part in my career development. In retrospect, Performance Solutions prepared me more for my future successes as an entrepreneur in the tech space, than my employment history or formal education did. As you can see from the various sections herein, I was determined to start up various tech businesses right from the stage when I was a starving student at Queens U. The motto 'if you don't succeed at first, try, try again' holds true in my case. 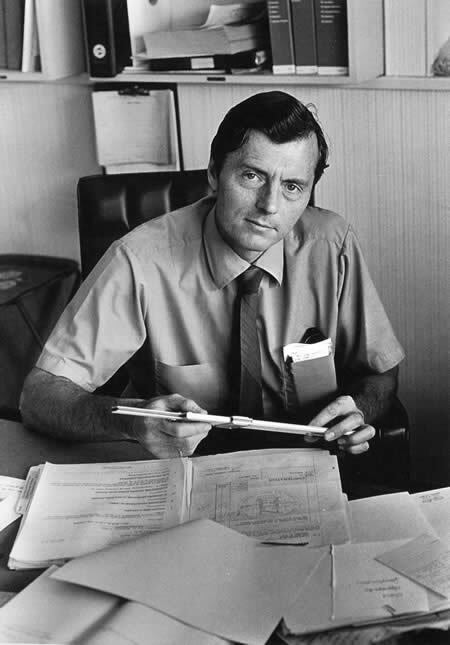 My father, Gordon Spratt - a Civil Engineer, has run his own consulting engineering practice for more than 40 years now, and has always specialized in concrete design work. He was aware, from his days studying concrete technologies when he was taking his Masters degree in Civil Engineering at McGill University in the 1950s, of a technique first proposed by J.M. Plowman, in the 1940s, to monitor the temperature of concrete as it cured, and then use this data to estimate the strength of that concrete, without having to resort to the time-honoured technique of cutting out a 'core sample' and then compressing it in a press until it actually broke to determine how strong it was. This technique became codified by ASTM (the association which codifies many scientific and engineering related procedures) under document ASTM C-1074. For an up to date paper on the history and application of the Maturity Method, please click here for a National Institute of Standards and Technology paper on the subject. 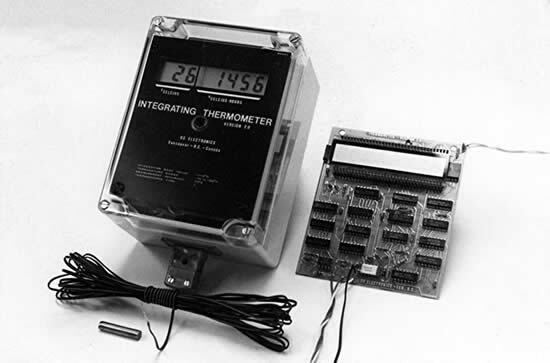 My father asked me after my first year in engineering school at Queens U in 1980 if I could help him rig up a data logger with temperature sensors to help him implement the maturity method on some job sites in Vancouver (in particular, the CIBC Building construction project at 400 Burrard St). I rented a 16 channel paper output data logger and built a semi-water proof wooden box for it in our backyard during the summer of 1980, and helped install it on the job sites, take the data and analyze it, and then write the reports for him. We learned a great deal from that first attempt - first of all, we knew that the maturity method in fact worked and generated reliable/accurate concrete strength estimation, and secondly, that using fragile, bulky and expensive data loggers on a construction site was a non-starter. The solution was to design a small, rugged, portable/battery operated meter - as there was no such product invented yet at that point in time. 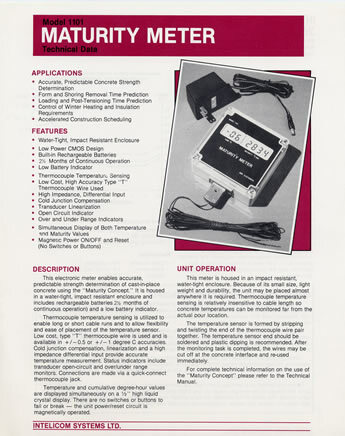 I accepted this product development challenge with my father's firm as the target customer of my design and manufacturing efforts, and I started to work on it part time over the next 3 years while in engineering school at Queens U. I completed and tested the initial design as I finished my 4th and final year at school in 1983. My first attempt at a volume production run of maturity meters involved a somewhat fragile design that saw me 'wire wrapping' 10 boards painstakingly by hand, that was mounted in a leaky enclosure - hence their early demise on construction sites around Vancouver. I do not have a photo or any surviving records of that first design. With the success of the above design, I went about writing a business plan for the development of a new version that could be mass produced and marketed worldwide. I paid a visit to a government industry consultant to seek advice on how to approach other firms to license such a design to them, thereby avoiding the need to raise investment capital to fund the manufacturing, marketing, sales and distribution costs associated with such an endevour. By good fortune, I connected up with Geoff Danzig, an entrepreneur who operated a business in the same building as DBA Communications, the firm I was working for immediately after graduating from Queens U - he was also an Electrical Engineer, and he agreed to license my design and pay my 7.5% royalty on the sale of each unit. We started off with the Model 1101 design below and managed to sell almost $1 million worth of meters (priced at US$595 each at the time) in a 3 year period. Geoff wanted to wrap up the electronics production side of his business so I agreed to license it to a firm in Ontario who had been a distributor of ours, Sartell. 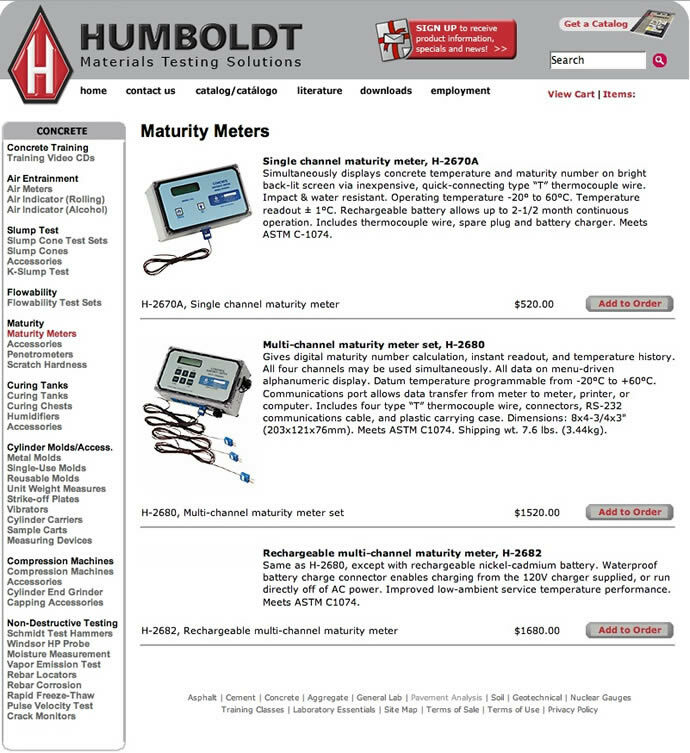 So today my 20 year old maturity designs still live on in the construction industry as leading maturity meter products available from Sartell and Humboldt (their US distributor). The 4101 meter and manual are still identical to my original meter design while the 1101 meter has been updated with a new housing and changes to the display and related circuitry. Needless to say I am proud to have been the original designer of concrete maturity meters in the industry - and must give my father credit for helping me along that path. Andrew Atkins (an entertainment industry lawyer and my closet friend), Doug Sereda (an investment banker/entrepreneur) and I got together to pursue a vision Doug had for a digital audio broadcast system. We met on numerous occasions to iron out the concept and put some meat behind the idea. After talking directly with Scientific Atlanta, who told us that they were developing a similar product concept, we pulled the plug on our efforts, even though, in retrospect, we had a fantastic idea that SA was no-where near developing - a concept for an open-platform TV set-top box, with expansion capabilities, that could accept downloadable digital content and offer it to consumers - both on their TV sets, as well as via digital and analog output connections to their computers and audio systems. Way ahead of its time . . .
Mike Lukas (a fellow engineering employee of Integra Systems at the time, as well as the co-founder of ERNEX - see below, and my eventual partner in Consequent Technologies - see Consequent Technology - History & Overview), Geoff Yue (a childhood friend and media consultant) and I decided to try our hand at developing a series of aftermarket automotive performance computers. 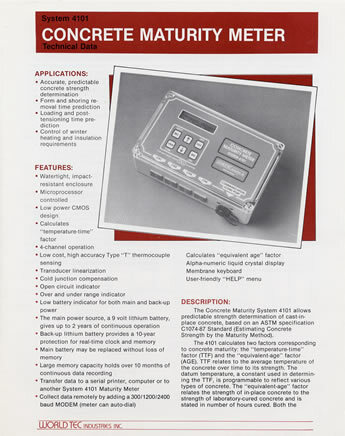 This was after I had developed a digital ignition timing controller for the same target market in 1985-1986 - a product concept and design that formed the basis for the concept and design of our Digitune product. Digitune was targeting the new computer controlled and fuel injected performance cars that were starting to arrive on the market in 1986. At that time there were no aftermarket computer 'hop up' electronics and most hot-rodders of the day thought that the arrival of computers meant the literal death of the performance aftermarket industry. We were out to prove them wrong - not only were we sure that computers were in fact tunable, but that computer controlled engines could out perform older carbureted designs (nowadays this is a well accepted fact). In order to promote the idea that aftermarket computer tuning accessories were a viable product concept, Geoff and I wrote a series of articles on computer controlled engines and had them published in a local magazine - Motorsports West (see below). The Digitune product was designed to allow for the adjustment of fuel flow and ignition timing, as well as control over additional aftermarket accessories such as nitrous oxide injection systems, turbo chargers and supercharger systems. It was a very advanced concept for its time but we were unable to attract investment capital to proceed beyond the design and prototyping phase - this was a pity because we had a chance to become leaders in a growing industry that married our love of all things automotive with our training and education in electrical engineering. As part of the promotion of our Digitune product concept, Geoff Yue and I wrote and published a series of articles on the subject of hot rodding computer controlled cars in the Canadian Motorsports West Magazine. 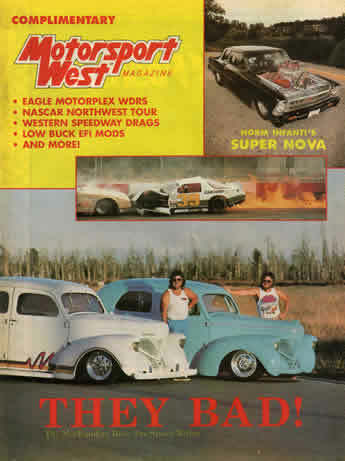 The owner/editor of the magazine was Larry Pfister, the same person who years later video taped my race cars at Mission Raceway as part of his Horsepower Heaven business. After leaving Nexus Engineering in 1992 I tried my hand at offering myself up as a product design consultant for hire. I worked for a number of local BC firms during that period on a range of interesting product design engagements. Perhaps the most rewarding was working with my old Integra Systems and Digitune colleague, Mike Lukas, at his firm, ERNEX/Credit Systems, tackling the design of a new POS terminal and pondering the age-old problem of how to get a slice of the credit/debit card transaction processing revenues that the banks collected from the use of our POS terminals (ERNEX/Credit Systems was an offshoot of Integra Systems - see Integra Systems - Overview & History). The answer came in the form of changing our business model from being a provider of POS terminals to the banks to a provider of services to the banks and their customers - in the form of offering to track customer transactions and offer discounts and incentives to them to earn their loyalty (and influence their buying behaviours). My role at ERNEX wasn't to roll out that business concept (which happened at the same time I was running PCS Wireless - see PCS Wireless - Overview and History), but to roll up my sleeves and design a new computer PCB for their upcoming POS terminal - a task that was my final act of designing computer hardware after years of perfecting that art form. ERNEX/Credit Systems was also a pioneer in parking meter systems and I spent a small amount of time helping improve that design by incorporating my new computer board into those products as well. ERNEX/Credit Systems was immediately successful with their customer loyalty financial transaction processing system and they indeed earned transaction processing fees for providing these services to their clients, which included Intrawest Corp - the company that owned and managed the Whistler ski resort - where the ERNEX system was used extensively. Eventually RBC/Moneris acquired ERNEX as a result of that success. I credit my initial interest in forming Performance Solutions from the inspiration my father gave me, a man who has shown considerable personal entrepreneurship over his long career, running his own successful engineering firm, Gordon Spratt & Associates, founded in 1964, which he still continues to be involved with today (click here for the Spratt Emanuel web site).